The same design as our Traditional Range Pedestal Desks, but with a cupboard door to house the tower unit, a keyboard centre drawer conversion and a filing drawer on metal extension runners. Hide away unsightly computer equipment, freeing up valuable desk top space. Drop down Keyboard drawer front, with pull out keyboard slide. Rear cupboard doors to help connect wiring. Made to measure options available. 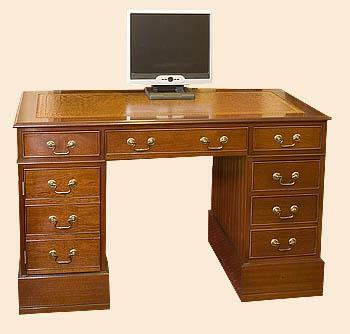 DCC05 Premier Range Tower Computer Desk - two sizes available, 4 cupboard/drawer options, plus made to measure option. 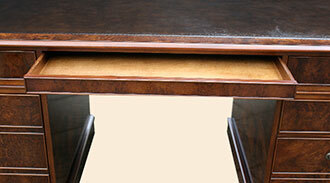 Desk shown above in Burr Elm Finish. Cupboard for Printer, with five drawers including a double filing drawer. Two cupboard doors, space for tower unit on one side. Printer on pull out slide on other side. Keyboard centre drawer with two single drawers either side. One cupboard door, (can be made on right or left pedestal). Space for Tower unit or printer on pull out slide. Filing drawer, plus keyboard centre drawer, with 3 single drawers. Two cupboard doors, space for Tower unit, with optional slide above for scanner if wanted. Printer on pull out slide on other side. Keyboard centre drawer with three single drawers. Full height cupboard allows tower unit and printer to be housed in one pedestal. Keyboard centre drawer. Filing drawer plus two single drawers. 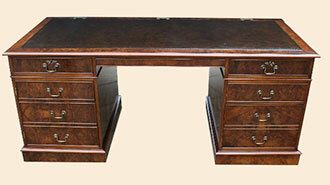 Desk shown above: 5’6” (167cm) x 2’6” (76cm) Medium Oak finish. Rear cupboard doors to help with connecting wiring and help with ventilation. One cupboard door, pull out slide for printer. (Can be made on right or left pedestal). Filing drawer, plus one single drawer and three top drawers. Options A, B, C and D shown above, can also be made without a keyboard centre drawer and replaced with a standard drawer if using a laptop. 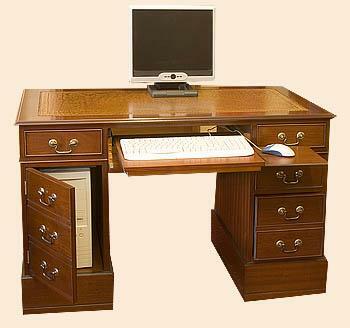 Desk shown. DCC06 Option E Laptop option. 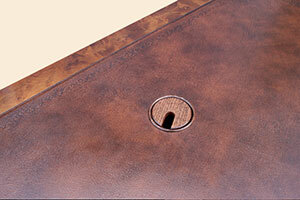 ( standard centre drawer ) Burr Oak Finish, Blue leather top. 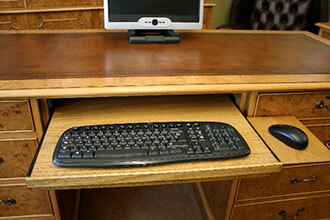 Useful for hiding unsightly cables that can then pass through the desk and out to a power supply. If a Keyboard drawer is not required and more legroom needed. 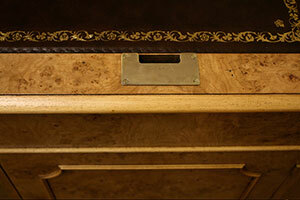 This No Cost option slimmer drawer will give more leg clearance space when working at the desk. A drop down centre drawer front with pull out keyboard tray and mouse platform slide. 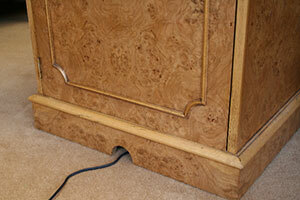 Cable mouse holes can be cut into the Desk plinth to allow wires to feed out to the power supply.